A few days ago on my morning walk (omg, my morning ritual is on fire!! but more on that later), the word “quest” kept coming into my consciousness. In and out as if trying to send me a message, the word quest, quest, quest. I am personally on a quest right now to take myself into a deeper layer of my work, both my professional work and my inner work. So, the fact that this word kept entering my mind makes sense. But, as I walked, the word seemed to spell itself into an acronym that I had to share with you. Now, I love a good acronym as a tool for remembering a framework or structure, but my creative (sometimes wild) brain doesn’t typically work in an acronym-loaded way. But, this one seemed to be handed to me like a little soft thought bubble falling out of the redwood trees. The letters appeared before me and they look like this. You can grieve in the time and way you need. You can try something new. You can ask for more. You can rekindle a relationship. You can walk back in. You can love more deeply. You can create a new ritual. Or, whatever is required. This Q.U.E.S.T. is about quieting the “shoulds" and the expectations, the patterns and the hurt. To quiet your chattering mind so that you can move forward or look back. I hope it’s a useful tool for you. For me, it’s been occupying my mind all morning. “Grace, quiet your ego so that you can write this blog post today. Quiet your ego so that you can take a morning walk before you commit to anything else. Quiet your ego so that you can go easy on yourself as you get back to work”. And so on….enjoy the QUEST. We’ve got this. This weekend I turn 44. Even my son was surprised...he thought I’ve been 41 “for a long time.” I’m sure I’ve missed some deadlines in the quest for eternal youth...my forehead still moves, I’m hardly ever vegan, and I don’t love Soul Cycle (sorry, not sorry). As I reflect on these recent years, I’m in awe not of the numbers on my birthday, but of what’s happened in this human experience. What I’ve learned. What I’ve lost. What has grown. And, what I’ve shed. As I’ve shared with you my dearest community, my sister, Maggie, died in May. Running my business amidst this personal crisis was hard and I became overwhelmed with stress and self-doubt. I don’t think I slept for what felt like most of 2018. The flip side is that I have never felt nor imagined the depth of love as I did during the precious time I had with my sister. Losing my sister and trying to participate in day-to-day life was a bit of a blur. I wandered. I cried. I couldn’t think. I couldn’t write. I resisted going to dance class. I was hurting and wanted to stay away from anything that brought me close to the deep places in my soul. My ability to manifest what I wanted felt broken; my magic touch no longer available to me. I became angry. I started to hate clichés and positive mantras...even the ones I had made up myself (and probably told you to do). I couldn’t be kind to myself, practice self-care, or show up fully...all of the things I prescribe to others. Darkness. During that time, a few leases and opportunities to open new Hivery locations fell apart. A guy in a shiny VC office mansplained that I had to open another Hivery fast in order to scale and “be relevant.” Otherwise, my work wouldn’t matter. I refrained from calling him a douche bag (victory bell!). The days felt heavy. People that I never expected stuck to my side like glue, some showed up in a blindingly love-filled way, and conversely some wandered off (or lost my phone number). Even with a tribe, the road felt dark. People often said, “I know you have so many people around who love you...” as if to say that I’d be fine, but the loneliness was intense. Through the cracks came faint melodies that started to sound like courage. 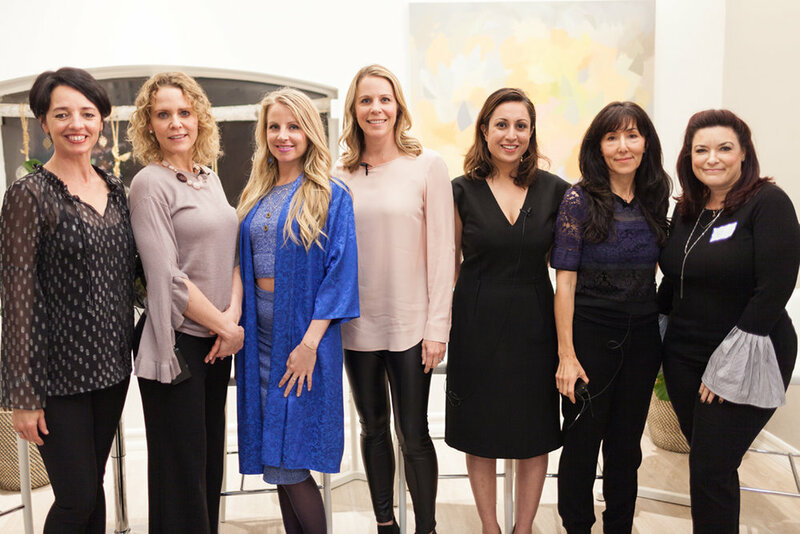 We gathered 350 women for our Entrepreneur + Inspiration Lab event in San Francisco that finally reminded me again of my creative zone. I learned that if I don’t express myself, I die a little inside. Very good to know. Life hack...don’t forget. Another victory bell would soon be in sight when the location we’d been working on for over a year in SF finally came through. That day at our big event, I felt the sunshine. That day I also met a world-class doctor. After meeting with her, to review my breast cancer risk (off the charts is what she called it, I believe), I decided to have a preventative double mastectomy. A couple months later, she held my hand and sang “Dear Theodosia” while I went under anesthesia. I woke up different, and in pain, but quite proud of myself for not chickening out. Glennon Doyle, you say “we can do hard things”…but geez. So, that’s what I’ve been up to. During these past two weeks of recovery, I’ve watched 18 movies and entire seasons of “Fixer Upper.” I refuse to look at my iPhone screen time report as the boredom has led to an insane (and inane!) amount of scrolling. I am in beta mode right now, striving for Grace 2.0...I think I need to design a 2.0 t-shirt. I’m entirely sick of bone broth. And the weirdest part? I’m happy. Confusingly, slowly, like moving underwater, humbly, happy. Hopeful. Willing. Ready. Alive. No longer attached to expectations, but thrilled to be here. Grateful for the love of a community I created, and just as grateful to be part of a world that I’m only a tiny molecule in. Here I sit, surrounded by the massive love in my house and in my life. In awe. More willing than ever to walk through the door of what’s possible. Compassionate for all those whose struggles and battles are so much harder than mine. It is not a comparison of hardships, but on the global scale, I know I’ve had it easy. My hurt softens me to the hurt of others, and for that, this whole thing has been a whopper of a gift. I see it again...the road ahead. And I’m squarely on it, facing forward. The rear view mirror is there to remind me of my fear, sadness and all that has been endured, but can be tilted away so as not to obstruct my view of the light. Licking my wounds, and putting a soft hand on yours, I have been beat up, broken-hearted, and reduced to pieces. I know you have, too. And I’m still here. With you. With so much love to give and so much more life in me. Screw resolutions. I’ve earned wisdom. And I intend to use it to create magnificent, bright spots on this curvy and unexpected road of life for as many humans as I can. As Pema Chodron writes, “Only to the extent that we expose ourselves over and over to annihilation can that which is indestructible be found in us.”… That’s the quest: to humbly accept fear, to know that we don’t know, to have courage to stand on shaky ground, and to love fully and deeply, anyway and always. Even with the unexpected. Even in the dark. There’s light. Don’t worry. Whether near or far, we’ve got each other. With unrelenting commitment, we’ve got this. Happy New Year, Hivery Community! 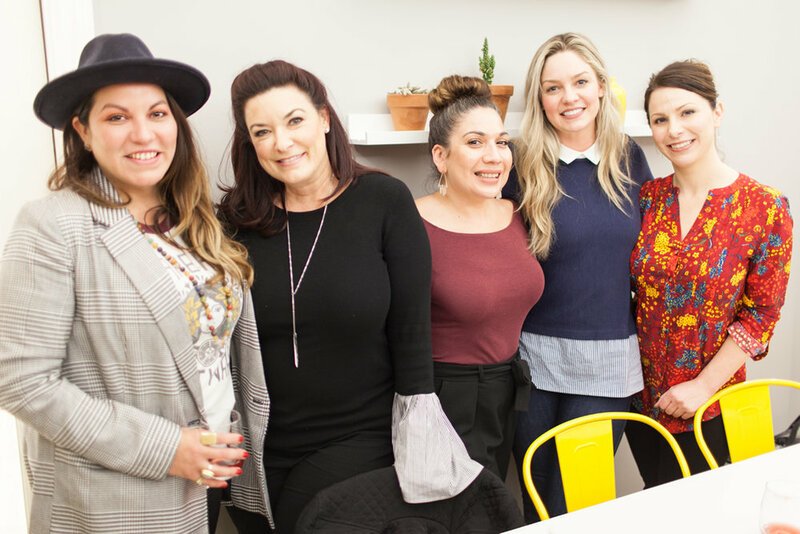 We kicked off 2018 with the January 8th Hivery Circle, which brought together several incredible women to share on the topic of renewal. For this month’s blog, I’d like to share a few of my words from that night on this very important topic. Wishing you all kindness, creativity, and community this year and always. At the start of every year, those who are curious, energized, and thoughtful look both introspectively and outside for what the New Year brings. For many of us, these new beginnings bring with them a sense of RENEWAL. Definition of RENEW: to make (something) new, fresh, or strong again. : to make (a promise, vow, etc.) again. : to begin again especially with more energy or enthusiasm. And yet, to renew, to begin again, to continue to evolve—it isn’t always the easiest path, is it? Complacency seems easier and at first less painful, but it can also be the root of agony. Stagnation causes heartbreak. It’s the desire to be our fullest selves that draws us into the topic of renewal. Through years of talking with and coaching women looking to create change in their lives (at the start of the year, or otherwise), I’ve been in the very lucky position of getting to observe traits that lead to lasting change. #2. We often refuse transformation or renewal due to insecurity and fear. (i.e. We have the power to make our own transformation a negative, and conversely we have the power to work through that refusal.) Throughout various stages of transformation, it’s often us who create the barriers to change. Barriers like, “I’m too old. I won’t make enough money. I don’t know what I’m doing. I don’t have enough time. I have too many other responsibilities.” These are all great ways to get in our own way. That internal mind chatter can be our most powerful and listened-to voice. Successful transformation occurs—not when we rid ourselves of that voice (as that is most often not realistic)—but when we learn to recognize the voice for what it is (fear) and develop the emotional fitness to keep moving forward anyway. #3. Transformation comes from a willingness to do the work. As Joseph Campbell used to say, “Dragons have to be slain again and again.” I spent years as a ballet dancer, and trained intensively for almost 20 years. I learned early on that I could want to be a “good” ballet dancer all day long, and I could read books about it, and fantasize about being onstage, and talk about it with anyone who would listen. But, the reality was that the only way to be a good ballet dancer was to show up, take class, and dance, even (or especially) when I didn’t feel like it. I wish there was another way. But, transformation requires work. And, not just “sometimes” work, but consistent work. Work doesn’t have to look like sweat. It can look like commitment to self, creative ritual, or morning meditation. But, the commitment piece is non-negotiable. You get what you pay for in the transformation department, and showing up is the most important part. #4. Real change occurs when we become willing to not know the outcome. If you’re looking for a clear, chartered path where everything is proven and knowable, you will wait your whole life to step into yourself. The beauty of living fully is that you trust your intuition enough to live bravely. Transformation often feels like being on the edge of a cliff, looking out at a dark abyss with only the light of some twinkling stars to tantalize you forward. You don’t want to turn around and retreat, even though it would be safer and more familiar territory. But, launching into the unknown is scary, too. True transformation comes when you are willing to let go of what is comfortable and known in order to step into the next chapter. Not knowing the outcome and trusting anyway is the creative process, and lasting change cannot be made without acceptance of the mystery of what is ahead. #5. Transformation is often not an explosion. Real transformation is a soft opening of the heart and the head that begins and ends with self-love. Transformation won’t strike you on a Tuesday and hold you in its’ grip for all the days of your life. Transformation is a process that washes through you, creating introspection, exploration, forgiveness, compassion, delight, and ultimately self-love. I’ll leave you with a story that showed me the way to realizing the importance of self-love these past few years. It was a gift to me through a series of dreams that were initially perplexing, and then eventually provided some much-needed guidance. My mom passed away nearly seven years ago. For a couple years after she died, I felt like I’d lost her completely. She hadn’t visited me in a dream, I couldn’t conjure her face up over the oceans, I couldn’t feel her presence...or so I thought...and I craved that connection. I was envious when people talked about being “visited” by a loved one who had passed; that seemed like an impossibility for me. But, simultaneously, and for years, I’d be woken up from a dream with a voice saying, “I love you. I love you. I love you.”... and for years it would startle me awake. Until one morning around 3 am, when I heard it again and again inside my own head. I thought I was going crazy. I could “feel” my mother’s presence, but was confused because it wasn’t her voice. Who was it? Repeating those words again and again? As I listened deeply, half-asleep, half-trying to figure this out, it was my voice. It was my sub-conscience reassuring me. I’ve always felt that it was the spirit of my mom who told me what I most needed to know. That it was not her love that I needed the most, it was my own. Love of any variety is a dichotomy of beauty and agony...self-love is no different. It can be painful and might feel like it needs to be shoved away, due to the ego or our fear of being self-absorbed, or our fear of not being enough for the only “you” you have. But, the ability to love ourselves is the single most impactful ingredient to the transformation of who you really are. Without it, you are simply an observer on the ride and revelation of your truest self. The desire to make personal, impactful change in one’s life is not enough on its’ own. With the exploration and commitment of these five truths, the adventure, joy, and magic of creating transformative change can become something that inspires and fuels you, long after the New Year’s excitement and resolutions have faded. Enjoy the bold and beautiful (albeit sometimes bumpy) journey of becoming who you really are. Thank you to our amazing panel for sharing their inspirational stories. Daniela Kratz from Farmhouse Lab. Our beloved community of members and guests. Sophie James Wine (Sophie & James pictured here!). The kind and wonderful women representing our incredible sponsor, SkinSpirit. I had an eye-opening experience this year around late October. I found an old notebook where I'd written out my New Year's resolutions for 2017. As I stared at the list with only a couple months left to go in the year, the words seemed to jump out at me. I hadn’t accomplished a single goal. I hadn't written a book, hadn't opened our second Hivery, and hadn't turned one of my workshops into an online course. "What a loser," my fear-brain piped in. I spent a good ten minutes being hard on myself. "You lost your focus." ... "You busied yourself with the wrong things." ... "What's wrong with you?" Wow. That's the kind of self-talk that I would never allow at The Hivery. And here I was, engaged in a lively verbal shake-down in my own head. With some quiet time and my favorite "hike it off" strategy, I was able to get re-centered on where those original goals came from, why they mattered to me, and what NOT accomplishing them this year taught me. With further introspection and review, I "remembered" that 2017 has been an unbelievable year, filled with growth, learning, expansion, incredible friendships, countless victory bell moments with our members, and most importantly, love, family and joy. I came back to my list a week later with fresh eyes and the knowledge that 2017 taught me a lot. Among the many lessons: in order to do anything new, I must go through the motions of exploring it, feeling it, and trying it on. That exploration time is part of my creative process and is not only time well-spent, but it is required for me to understand how important a goal is to me. I also learned that it is perfectly fine to walk away from a so-called goal, or answer the goal with “not now" if it doesn’t actually serve me, or just doesn’t feel right. I started thinking: what if I could reflect back on the past year and think about the things I did do rather than the things I didn’t do? What if I could look at the learnings I gained from moments when I had to change direction? Moments when things didn’t go according to plan? I realized that I, like Angelica, want something a little different. I don’t want to be bound by a holiday-based goal. I want to live, learn, change course, and create something. More than anything, I want to feel alive. That doesn’t always tie back to a goal I made in late December. That’s something I carry inside all year long. This change in thought did wonders for my disposition and has completely altered the way I look at goal-setting, especially as it relates to the proverbial New Year’s resolutions. I would love to bust the perfection myth around this beginning-of-each-year tradition. New Year’s resolutions can disconnect us from the centeredness of actually being on the right track in order to somehow redirect us to thinking that something distant from us is really what we want. What’s more, that that distant thing is only attainable if we force ourselves into it at the outset of every New Year. So how do we look at New Years’ goals with renewed perspective? Get clear on your ‘why.’ Take a moment to think about the deeper reasons behind your goal. For me to do this, I have to get very quiet with myself. Only then can I assess my truth of either aiming for what I call a “should" goal vs. a goal that is inspiring and meaningful to me deep down. Create a support structure. For the record, I’m not a goal-hater…and tbh (as my teenager says for "to be honest"), I’ll probably make some New Year’s resolutions again this year. I think goals can be good things, but in order to serve us, each one needs to have a support structure around it. If your goal is to write a book, the first question is why? Why now? What story do you need to tell? Then, think about timing. When will you start outlining chapters? Will you start by trying to write for 10 minutes every day for two weeks? Would it be helpful if you joined a writers’ group, or even came to The Hivery every Tuesday and designated that your writing day? When you aren’t feeling your best, whom will you call to help prop you up and give you words of encouragement? Having an accountability buddy or mentor to coach you through the inevitable dips really works, especially for big, long-term goals. The need for support structure applies to all goals, from losing weight to spending time outdoors to travel. What support can you put around your objectives to help you along? Prioritize the way you want to feel in the New Year. Back in late November, I had the great fortune of attending Hivery member Megan Flatt’s Post-It Note Happy Hour in our Creative Studio. 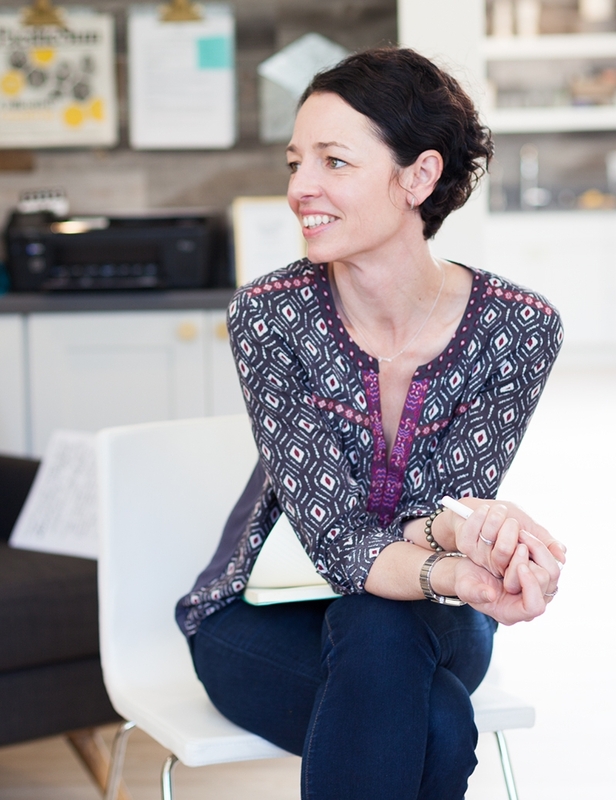 I love Megan’s insights as a coach and was really taken by her first question to the class. Instead of asking what our goals were, she asked how we wanted to feel. We all wrote down the first things that came to us and it was incredible what my co-participants expressed. I want to feel expansive. I want to feel relaxed. I want to feel open. My desired feeling? To live at the epicenter of my creativity. I stared at my post-It and thought: wait! I do feel that way! Who cares if I didn’t achieve my New Year’s goals? I do feel like I’m living at the epicenter of my creativity every day. Realizing that was an incredible feeling. I had achieved my goal, albeit a different and more important one than I had written down as my resolution for the year. Think about what you did do vs. what you didn’t do. To reiterate something I said earlier when I let you into the self-talk in my head, I think it can be easy for us to focus on our failures rather than on our successes. I’m willing to bet you scaled many mountains this year, even if they didn’t match your goal list. For this upcoming year, focus on how you want to feel, stay away from “should” goals, and create a structure for support (that’s what The Hivery is for!). As always, you’ve got this. This month's theme at The Hivery is Making an Impact. We've explored how to do that at the business level through social responsibility strategies, at the local level at a nearby school's garden cleanup, and at a community level through our We Rise Scholarship program. Often, the question isn't "Do I want to make an impact?," but rather, "How do I make the best impact I can with the tools and resources I've been given?" 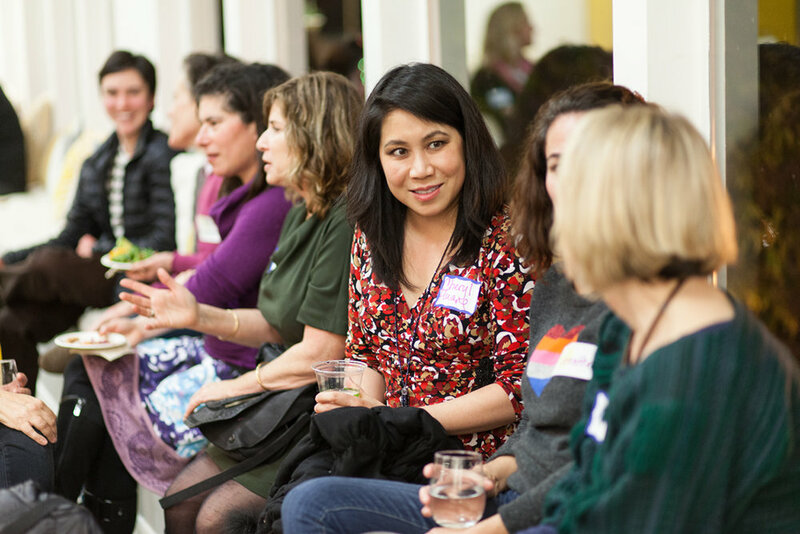 From the work that I've done with women at The Hivery and from my very fortunate position of getting to be part of many women's next chapters, I've learned that finding your unique contribution to this world often starts with sharing your story. We have the capacity to serve others and make a massive impact when we are willing to share ourselves. From there, we can approach our service to others with open hearts and our truest voice. Below is a step that I took a few years ago to step out. I often talk at The Hivery about what it means to put yourself out there and the power of telling your story. By making a practice of using our voices and taking creative risks, we expand what is possible, not just in ourselves, but in the impact we can have on others. Today, I wanted to share a story of taking a personal risk in order to open up my mind, heart, and practice so that I could encourage other women to do the same. My legs shook uncontrollably on a foggy day in early 2014 as I walked into the basement of the Mill Valley Public Library. I took a deep breath and opened the door to a panel of five adults who were minutes away from judging me as I auditioned for Listen To Your Mother, a nationwide storytelling series, with a live performance at the Brava Theater in the Mission District in San Francisco. It had been a long time since I'd auditioned for anything. The nerves, self-doubt, and slightly sick stomach of my previous life as a dancer, flooded back. I suddenly remembered the reason that I often hated auditions. The vulnerability, the risk of rejection, the fear of humiliation. Giving yourself completely to your craft, and then holding your breath while another person judges you, is not for the faint of heart. But there I was. This time using a story that I had written about my mother as my medium, instead of my dancing feet. This was perhaps my most personal story, a story some friends didn’t even know. I decided to listen to that voice and began. I was nervous, but determined to stretch my own boundaries. When I began telling my story, my voice shook, but as the story continued, I felt in my gut, that I was meant to share my experience. The audition went so well that I was selected to open the show a few months later in San Francisco. The night of the event I couldn’t have been more nervous. Who was I to tell my story to an audience of 300 strangers? And, would anyone care to hear it? But as I stepped on stage, something happened, something physiological. I shakily brought the microphone to my mouth and instead of a high, fluttery voice, I heard a lower, more solid, tone come out. I spoke from a place deep within my belly. It was at that moment that I realized that it was there where my truth lived all along. The story went great and the audience receptive and warm (read to the end of this post to watch my talk! ), but I learned so much more from the experience than I ever could have anticipated. I learned that I wanted to speak like this, live like this, for the rest of my life. I launched The Hivery a few months later and since then have called upon that deep place inside myself more times than I can count, especially when telling a story about fear or vulnerability. Every time I’ve spoken the truth about being scared, about having no idea what I’m doing (I still feel that way on a weekly basis! ), about feeling in-over-my-head, I hear “me toos” from countless women. I’ve learned that using our voices can be one of the most authentic ways to make an impact. That courage is contagious and can have ripple effects on humanity. I’ve learned that our deepest impact is our personal impact that can then be unleashed in service, and being honest, open and vulnerable is one of the most effective ways to not only set us free but to set those around us free, too. Just in case you’re wondering how you can make an impact—be it by getting on stage, starting a new project, helping a neighbor, or the like, here are my three biggest pieces of advice. Share it. Have an idea? Share it with five people in one week and watch the ripple effect. I’m willing to bet that one of those people will say something that spurs on a second action, then a third, then a fourth, and so on. Believe in the power of small actions. I believe small actions lead to big actions. Challenge yourself to do one action every day, even if that action is writing a paragraph in your journal about what you want to do or believe in. No action is too small. Let your impact permeate your life. If you have an interest in making an impact in one area, start approaching other aspects of your life with the same thoughtfulness. When I wanted to make an impact with women and work, I knew I’d needed to show up with compassion, listen and make space. I quickly learned that I operate best when I approach my friends and family in the same way. Bottom line: There are so many ways to make an impact. Spreading your truth, speaking your mind, being vulnerable—those are amazing ways to help yourself and those around you. I believe that every hour you have the opportunity to be of service to another human being. You don’t have to wait to be an executive director of a non-profit. You can make an impact right now, as you are reading this—in this moment! Thank you for reading my very first post in a series called “Grace’s Corner!” In this monthly series we will explore our monthly theme at The Hivery, and my thoughts and advice around it. If you would like to see my Listen To Your Mother performance, click the image below.